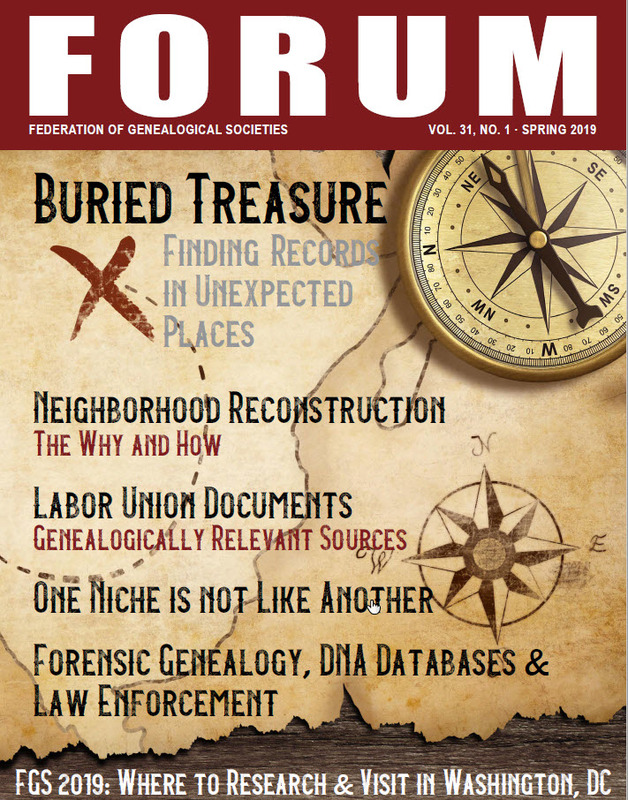 The Federation of Genealogical Societies publishes FORUM, a quarterly interactive electronic magazine providing current information essential to the informed genealogist. Society leaders and delegates of FGS member organizations have access to the magazine as part of their member benefits. Subscriptions are available to others for purchase. Scroll down for those details. FORUM subscriptions are only $15 a year! Get a 2-year subscription for $25 or a 3-year subscription for $30! Use the online application, even if you wish to mail in a check for payment. After completing the application information, you will have a choice to pay online by credit card or mail in a check (by selecting "Pay Later" and "I will mail in a check."). Using the online form will enable your new account to be created immediately. If you pay online, you will have immediate access to the magazine. If you choose mailing a payment, your subscription will not be available until payment is received. FORUM subscribers should go to the Access FORUM Subscription page to download the magazine. Member society leaders should go to the FORUM Archives under Members Only to download the magazine. Users must be signed in first. Curious about FORUM? Download a free issue: Vol 28, No. 2, Summer 2016 (published June 2016). FORUM welcomes article submissions from the genealogical community. Submissions can be sent to FORUM Managing Editor Julie Tarr at forumeditor@fgs.org. Please review our writer's guidelines. See Advertise in FORUM for details about advertising opportunities. If you have a publication or product for review contact FORUM Managing Editor Julie Tarr at forumeditor@fgs.org. Please contact the managing editor with any additional questions. Thank you for your interest!